First launch SOFTIMAGE | XSI and look around. Click the image to view a larger one that includes some tips. You'll be using all three buttons on your mouse quite a lot in this software. (So, if you don't have a 3 button mouse, I suggest you get one) When you click the middle mouse button on a toolbar function, or menu, it will activate the last function used in this menu without having to display the list. The default keyboard shortcuts are displayed on the right side of the drop down lists. You can create your own keyboard shortcuts from the default panel. The keyboard mapping menu will display a virtual keyboard with the keys assigned on it. The keyboard sortcuts 1,2,3 and 4 change from one module to other, the colors changeto reflect the module. Nonetheless most of the functions are available in the upper menu bar, and some menus are present in all the modules like get primitive... Changing from one module to another is really necessary when you work particularly on a specific element of the workflow. The Layout menu in the upper menu bar allows you to modify and create interfaces with edit layout, new layout, save layout, copy, paste, rename, remove... The taskbar, when visible (using the view menu) allows to choose an interface. Shortcuts keys can be assigned to interfaces. Editing a new interface can be done from scratch, from an existing interface copy or by modifying a current interface. It is really fast, you can split the screen everywhere and insert panels, editors, custom scripts, thus you see the current scene in the new interface. Once the interface is created, you can save it. 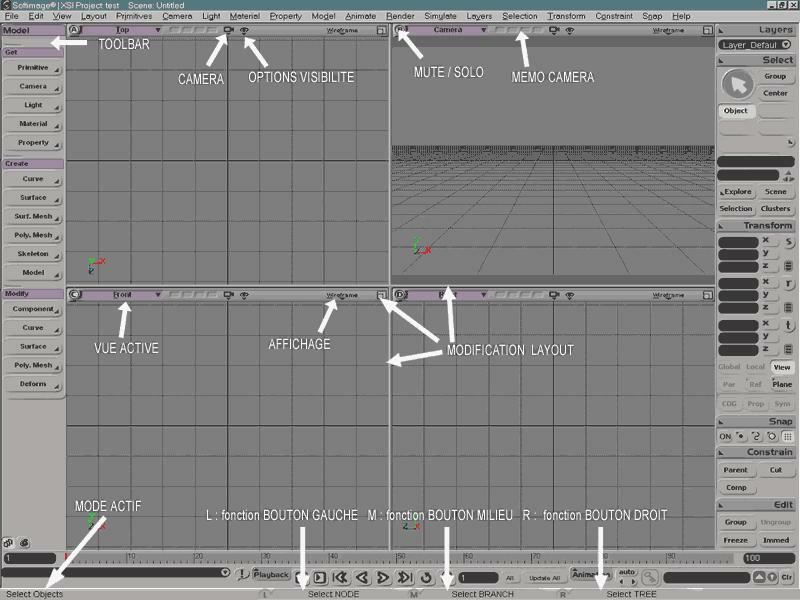 The layout menu allows you to import / export interfaces, scripts, toolbars and keyboard shortcuts. Browse to the file then click... the new interface and toolbars will be available immediately. You can delete the file after importing. Exporting is as simple as importing : give a the file a name, choose the elements you want to export. The file menu allows access to the user preferences. Tip: check Tab Style Editor in the General section, it will make the property editor display clearer ( You must restart XSI in order to see the changes ). Autobackup may also be activated. The "Give windows Focus option" will activate the window under the cursor (Unix feeling).This can be annoying if you use lots of flotting windows like "editors views"
Adjust Editor Size option readjust automatically the size of the window depending on the content, thus optimizing viewing space...Great ! One of the main goals of XSI is optimizing space and avoiding clutter of the working space. There are a lot of tips to speed up, cleanup ...This software is just a Masterpiece! WITHOUT: The dialog box covers the object, a lot of elements displayed onscreen. WITH: With tab mode, the working space isn't cluttered and parameters can be modified from the different Tabs. You can display any editor in a 3D view or in a flotting window. The "Give windows Focus" option will be annoying if you have many floating windows... one over the other. Viewing in a 3D view will, then keep your interface more organized. You can change a 3D view directly with an editor. A middle mouse button click on the name of the view allows you to exchange with the previous view. Editors can also be displayed as floating windows. The pros are that you can freely translate , resize or hide them (by clicking twice on its name bar). You can also open any number of the same editor at the same time. The cons are that you start cluttering your workspace and if the Give windows Focus option is checked, you will rapidely loose control with the different floating windows as the mouse cursors passes over them. All the underlined letters are keyboard shortcuts, that you can access as explained before. Only the upper menu bar must be acceded with the Alt key + underlined letter. You can now access rapidly the most frequently used commands.